September 8 | 2018. The Via Ferrata (Iron Path) | Peter M. Schloss | J.D. - Mediator. It is a rare treat at my age (66) to be presented with the opportunity for a new experience. 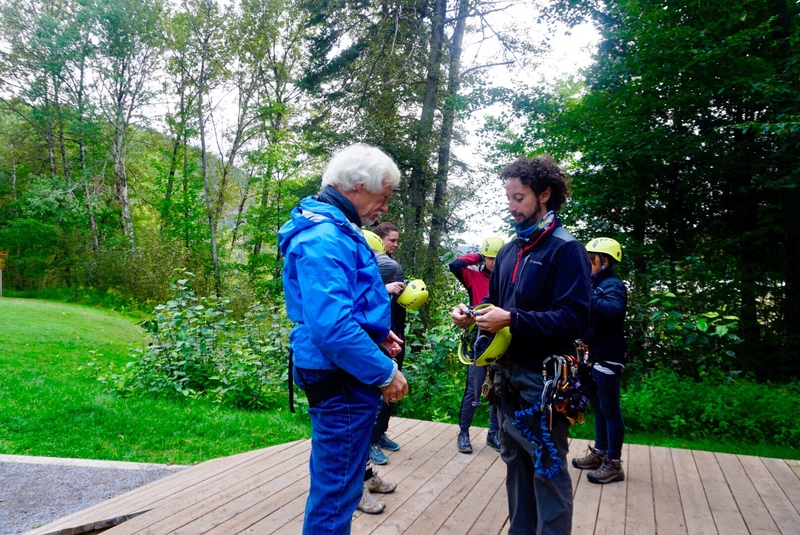 The pictures of Parc-du-Saguenay’s Via Ferrata were an enticement to me that proved more compelling than Christine’s disapproval. Her concerns are understandable given her own fear of heights and the death of a good friend who fell this last May while hiking in Scotland. A Via Ferrata is a technical mountain climb along an established path that features permanently installed climbing aids (often of iron or steel) such as cables, hand holds, iron rungs, ladders, and narrow beam bridges. Harnesses must be utilized as the Via Ferrata ascends and crosses sheer cliff faces, often hundreds of feet above the valley below. Via Ferratas are popular in the Alps, and are less well know in North America. The modern incarnations have their roots in the 19th Century as these aids were permanently installed along popular climbing routes in the Alps. The First World War saw the construction of Ferratas in order to facilitate the movement of troops along perilous mountain paths. It is believed that there are now over 1,000 Ferrata routes in Europe. 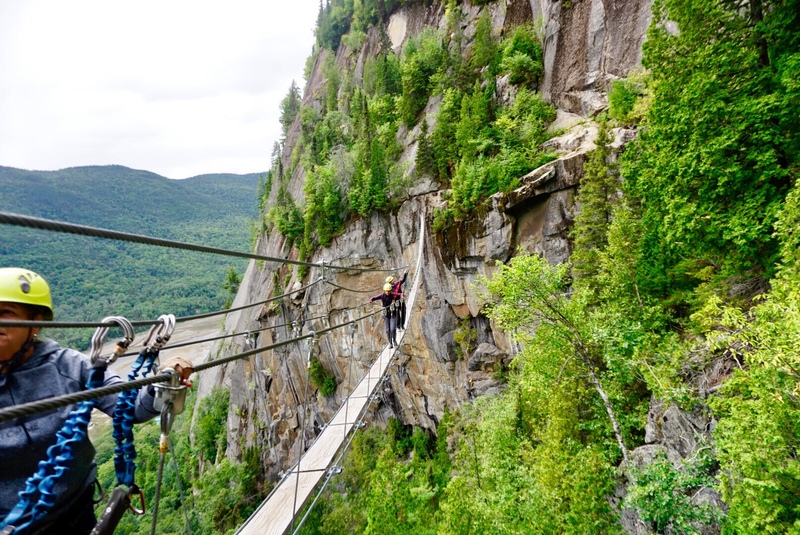 Parc-du-Saguenay’s Via Ferrata likely ranks as one of intermediate difficulty. It features very steep cliff ascents, in one place beyond vertical, traverses with minimal hand and foot holds, short passages across 4 inch wide beams, and precipitous rock scrambles. All of this takes place hundreds of feet above the valley below. It requires a fair degree of upper body strength and a constitution immune from fear of heights. Finally, the real gem of the experience is the crossing of the valley by a 1 foot wide, 300 foot long open sided cable bridge. The expedition is limited to 8 participants and an experienced guide. There were 7 in my group. The route took a little over 3 hours to complete, including the 30 minute assessment and training portion. A short near ground course provides the guide with teaching aids with which he demonstrates the use of the equipment. It also allows him to assess the abilities of the participants. Any person who does not appear capable of competence, lacks sufficient strength, or displays excessive fear, is denied further participation. Everyone qualified in my outing, but I confess that I was initially concerned that I might “wash out” because of my age and my pronounced hand tremors (a life-long genetic condition that has worsened with age) which can easily be misinterpreted as fear or Parkinson’s disease. As it turned out my “test” went very well. Throughout most of the journey I and a young couple from Belgium and France were placed ahead of our guide, Sebastian. He later told me that he frequently has to reject a candidate out of concern that their fear or lack of ability present a danger to all participants within a group. The entire experience was beyond my pre-departure comprehension. At times it took on the aspect of an out-of-body experience for me… clinging to the face of cliffs, climbing ladder rungs where my head and hands were further out than my feet, which sought to swing free beneath me. There was little fear, virtually no adrenaline, only exhilaration. In this I may have been alone among my fellow climbers. I was the only member taking pictures and often hung hands free by my harness to point and shoot my camera. As I write this I remain a bit mystified at my reactions. Perhaps they derive from my trust in the equipment and those who designed the route. However, I did find an internal voice cautioning me to always make sure that one carabiner was firmly in place before repositioning the other. My life depended upon that small detail. One of the members of our group was a young lady from France who might be 5 feet tall but only if she stands on her toes. She was situated ahead of me with her boyfriend in the lead. As we crossed the cable bridge the arc of the safety cable took it beyond her reach. At 10 foot intervals we were required to unclip from the cable and then reclip past each of the attachment points. She was unable to do this until in unison I and her boyfriend reached up and hung our weight from the cable, pulling it down to within her reach. Although I was the sole native English speaker, a comradeship of accomplishment developed within our group. The combination of the interpersonal experience along with the physical and emotional challenges created an incredibly memorable experience! PS: Later in the day Christine and I traveled to place along the Fjord where a short hike rewarded us with some of the most astounding views of this incredible region. ← September 7, 2018. Saguenay Fjord Excursion. Spectacular photos, as usual. T;hanks. Wonderful! Thank you for the tip. Wow Pete. Very impressed. You seem to have no fear for any adventure! Peter, you are more daring than I ever imagined. Now this is done–take a deep breath –no more such challenges–We all need you to stay well.. Oh ! My!! St. Peter must have been with you all the way. Mom, I am only surprised that you did not refer to me by both my fist and middle names! I am completely satisfied with experiencing the Iron Path vicariously through your words and pictures. Thanks for documenting your day so thoroughly. I think your safety advice applies equally well on the ground as well as hanging off the side of a mountain: “Always make sure one carabiner is firmly in place before repositioning the other.” My new words to live by. Tom, I hadn’t thought of that in terms of a life metaphor, but it’s a good one. Thanks! I say “WOW!” and I agree with all the above posts, what else can I say. I love your comment back to your mother! Your adventurous spirit is amazing. I got a little nervous just looking at the amazing photos! Stay safe and healthy! Thank you Julie! BTW after Mom posted we spoke by telephone and indeed she did call me “Peter Michael”!! Oh, my friend, sometimes you scare the crap (forgive my language, please) out of me. I get vertigo just standing on a chair, so, yes, several of your gorgeous photographs also gave me the heebie-jibbies! I would truly appreciate your keeping your wandering feet firmly on terra firma! Whew, I still have the willies! Christine, I really enjoyed your comment! !